Carolina Panthers quarterback Cam Newton is being sued for reportedly trashing a California mansion after his dismal performance in the Super Bowl. According to Yahoo! 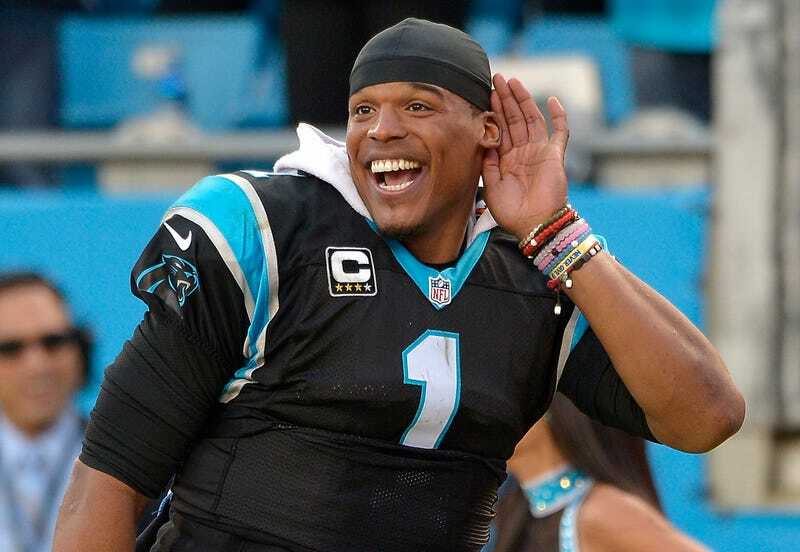 Sports, Newton is "facing a $270,000 lawsuit over alleged damages to an $11 million home he rented in Beverly Hills." Newton rented the luxury home during the summer from a company managed by Jared Pobre, husband of former WWE wrestler Stacy Keibler. The agreement was that Newton would rent the place for 61 days for $123,000 and there would be no parties or smoking while he was in the place. But we all know how that went. I mean, did they really expect Newton to shell out $100,000 just to try on little pants and fancy hats? Whatever happened in the mansion, Pobre's lawsuit claims that he had to replace a $32,930.48 rug, plus fix water damage to the floors and walls. The lawsuit also alleges that because the repairs took time, the property was off the market for two months and lost some $144,000 in revenue. Pobre claims in the lawsuit that he asked Newton to pay some $90,000 for damages, but Newton has not paid, Yahoo! Sports reports. "We’re expecting Cam Newton to be held accountable for actions for damages he caused,” Richard K. Howell, attorney for Pobre, told ESPN. Read more at Yahoo! Sports and ESPN.